Improved tread and drainage on Elk Pass trail shortly before the pass. 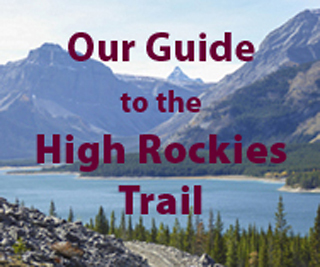 The southernmost section of the High Rockies Trail through Peter Lougheed Provincial Park from Boulton Creek to Elk Pass uses existing ski trails. Some sections of Fox Creek and Elk Pass trails were rough and rooty or badly drained and wet. So trail crews were in there this summer to fix them up. Boulton between Elk Pass trail and Fox Creek trail has improved tread in many places and some minor re-routes. The rooty section of Fox Creek from the 2nd bridge to Elk Pass trail has had fill added to give a smooth tread. It has not been widened. At the Ekl Pass–Hydroline junction the trail goes straight ahead rather than swinging round to the right. At Patterson, the High Rockies trail takes a line up the bank, emerging just before the Blueberry Hill junction. Skiers will still follow the S-bend. From the Blueberry Hill Junction to Elk Pas at the powerline there has been extensive drainage and tread rebuilding with as much as a couple of feet of fill added in some places. Improved tread on a rooty section of Fox Creek trail. This is all good news for skiers as the smooth treads will result in better early-season conditions. Now if only K-country could come up with a better alternative for snowshoers than flogging up Hydroline. It would not be that difficult!